This week i’ve been sharing my most recent writing around ‘Black Swans: Disruptions in Power’ at a conference in the US. This work is about types of disruption, the underlying power behind that disruption, and the inability of formal systems to effectively counter it. It links into the broadest organising principle of the Social Age: that we have formal systems (artificial constructs, up to the magnitude of countries, religions, companies etc), social systems (organising principles of the social, tribal, structure), and ecosystem factors (the Social Age itself, with it’s evolved dynamics of power, democratisation of technology etc). Today, i’m sharing the first sketch of a framework around this: it’s trying to present two frames of change, ‘change of the system’, and ‘change of the ecosystem’. I should stress that this is the very earliest stage of #WorkingOutLoud, and an early sketch, so i expect this to evolve significantly. Here’s a narrative around the model. The vertical axis takes us from ‘known challenge’, through to ‘unknown challenge’. In a typical view of ‘Black Swan’ events, we would consider ‘known challenges’ to be those that we have prepared strength for, and ‘unknown challenges’ to be those which may subvert us. The horizontal axis takes us from ‘known space’, which is the ecosystem that we are familiar with (and hence the ecosystem that our Organisation structure is optimised within), through to ‘unknown space‘, which is the new, and largely uncharted space of the Social Age, with many redistributed structures of power, new models of organisation, etc. Beneath this, there’s a narrative that i’m trying to draw out: the formal system, through great effort and expenditure, can adapt, it can stay afloat in the unknown space. That’s how most organisations adapt: formally, through programmatic approaches. In an old ecosystem, that was ok, because change tended to occur episodically. But in the Social Age, change is constant, and we never land the adaptation, which is where our risk comes. We end up in organisations that are effective, at great cost, but are actively sub optimised for the new world. This notion of ‘sub optimisation’ is one i’ve been chewing on for a while: it’s not simply that they are ineffective in a new space, but rather that they are actively sub optimised. Because they are optimised in a different space, an older one. 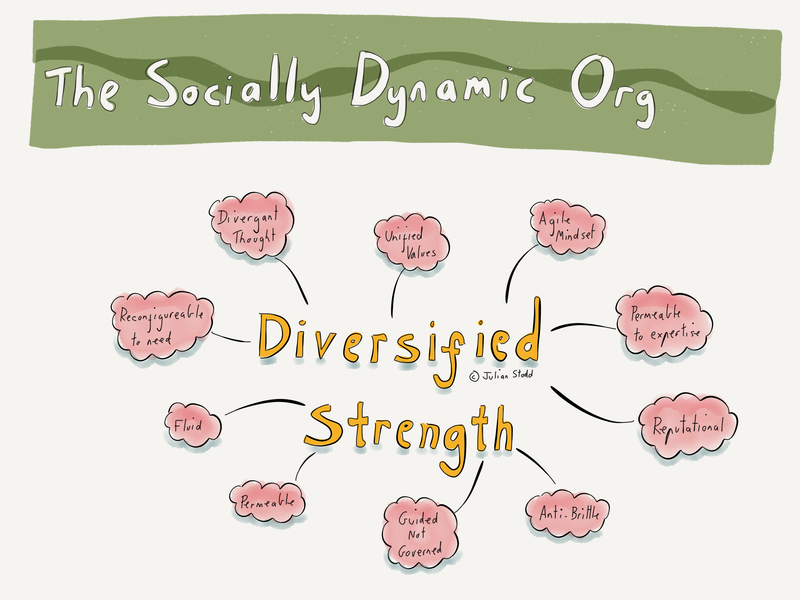 This is a premise i’ve been chasing in the work on the Socially Dynamic Organisation: an organisation with a new type of strength, a strength founded in it’s ability to change. Our adaptation must take place in two ways: firstly, we still need this formal ability to change, but secondly, we must map the new space, understand the dynamics. And with that understanding, we must move to new models of organisation. For as long as we hold on to organisational structures that are rooted in the industrial age, the best we can achieve is sub optimisation at great cost. Only if we evolve our organising structure, become more Socially Dynamic, can we adapt our formal models of change in a new space. This entry was posted in Change and tagged Black Swans, Change, Leadership, Organisational Design, Power. Bookmark the permalink. Hi Julian. I really like the swan concept on axes. 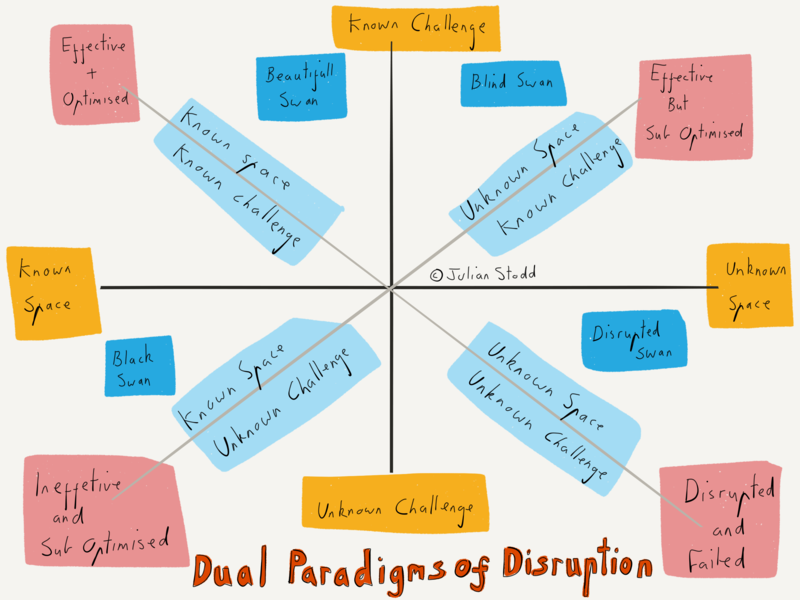 Dead swan is correct for the quadrant that has an unkown challenge in an unkown space – this is where I believe the Ubers and Air BnBs are for the many companies that have suffered. That’s a nice point Ian, thanks!